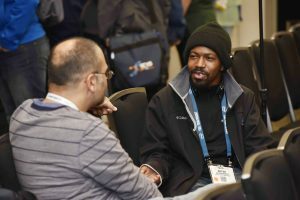 Although Lingfei (Teddy) Wu, a computer science Ph.D. student, spent a lot of time presenting his research and working as a student volunteer at SC15, he also made time to look ahead to his career. 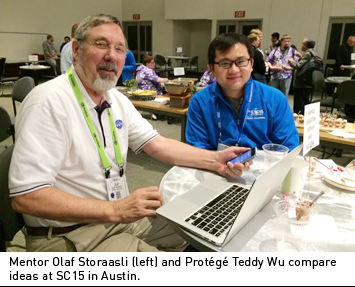 Wu participated in the SC15 Mentor- Protégé program, getting to know his mentor, Olaf Storaasli, and learn more about both the conference and Storaasli’s career path. As a mentor, Storaasli had a wealth of information to share – he’s been attending the conference since 1989. He also has rich experience in supercomputing, having worked at NASA, Oak Ridge National Laboratory, Centrus and now at Synective Labs, as well as serving as an advisor for European Union supercomputing initiatives. Looking back, Wu said he had a great experience getting to know Storaasli, who has mentored more than 35 high school and university students during his career. They met even before the Monday afternoon mixer that officially kicks off the SC Mentor-Protégé program to get acquainted. During the mixer they had more time to discuss SC15 and Wu’s participation, as well as plans for Storaasli to introduce Wu to other attendees that he knew, who might be good contact. Wu said he also picked up some background that helped him when applying for jobs, which he found very beneficial. Wu, who is researching high-performance algorithms for singular value problems and also data mining and machine learning, plans to complete his doctorate at the College of William and Mary in Virginia this summer. He already has a job lined up at IBM. At SC15, Wu presented a poster for the ACM Student Research Competition and also presented at the Doctoral Showcase. Wu had previously attended SC14, so he wasn’t completely new to the conference, but welcomed the chance to learn more about it and meet more people there. He said the Mentor- Protégé Program helps bridge the gap between young researchers and more experienced conference attendees. Wu said he feels that a researcher’s passion helps them get past difficulties and challenges they encounter along the way and is comforted to hear that mentors also had struggles when they were young, and had to seek solutions to solve their problems. Based on his experiences, Wu is already is considering being a mentor in the SC Mentor- Protégé Program some day in order to share his conference and career experiences.